I was so excited when I bought this coz I thought I was going to create magic with it, little did I realize that it was going to cause my hand to look like a claw after constantly pressing it and it hurt too! It's very hard to control. Okay if you just want dots on your nails, but not for neat intricate designs. This, on the other hand, is a nice little tool to have. It cleans off smudges easily and more precise than with a Q-tip. Bourjois 1 seconde nail polishes are my favorites, because they come in such beautiful colors and the fan brush makes application effortless. And yeah, they do dry fast too, so that's a plus for the impatient ones, like me. Nice nice ! i like the ribbon !im so lauzy at art ! I am SO off to go get the manicure pen. I neeed that sucker. Especially for dark nails! OMG! that design on ya nail is sooo cute! 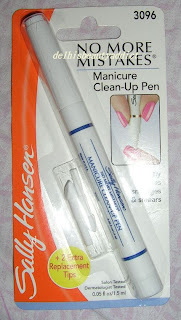 I have been wanting the Sally Hansen Pen Corrector since a long time.. since am very lousy with applying nail paint.. & also their under-the-nail white pencil (forgot what it was called..) they are not available here in mumbai... But yr nails look really cute..
i love the design you did on your nails, so cute!! @Tanveer..i haven't tried SH white pencil yet. The only one i've used is Oriflame's n its very useless.